A treatment called eye-movement desensitization and reprocessing alleviates post-traumatic stress disorder through enigmatic mechanisms. A study in mice offers potential clues into the biological basis of this approach. Andrew Holmes is at the Laboratory of Behavioral and Genomic Neuroscience, National Institute on Alcohol Abuse and Alcoholism, National Institutes of Health, Bethesda, Maryland 20008, USA. We live in stressful times. Epidemiological studies document a rise in the prevalence of ‘classic’ stress-related illnesses, such as major depression, post-traumatic stress disorder (PTSD) and anxiety disorders, as well as addictions and other conditions that are often triggered by stress1. Fortunately, modern neuroscience is coming up with new strategies to decipher how the brain deals with stress, with the ultimate goal of combating stress-related illness. 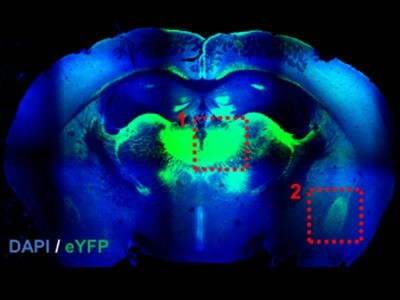 Writing in Nature, Baek et al.2 provide an example of the power of such strategies, using a combination of state-of-the-art neuroscience techniques and a creative behavioural assay in mice. Experiencing the slow drip of chronic stress (caused, for example, by daily life in a war zone) is fundamentally different from going through a major traumatic event (for example, running over an improvised explosive device). Acute and intense stressors can become bound in memory with specific environmental stimuli, which serve as reminders of the original traumatic episode and alert us to potential dangers in the future. In PTSD, however, these stimuli become potent and pervasive anxiety triggers. Herein lies a therapeutic opportunity, because exposure to trauma reminders without resultant harm (for example, in the safety of a therapist’s office) produces a new form of memory (called extinction memory) that reduces anxiety. This approach, known as extinction therapy, is a mainstay of PTSD treatment3, but it doesn’t work in all patients, and its effects often weaken over time. Therefore, major efforts are being made to identify ways to strengthen the process of extinction, for instance by delivering drugs that enhance the formation and consolidation of extinction memories4. The focus of Baek and colleagues’ study is a psychological treatment called eye-movement desensitization and reprocessing (EMDR). In EMDR, the patient recalls a trauma while being shown visual stimuli designed to stimulate repetitive eye movements (a process known as alternating bilateral stimulation, or ABS)5. Several major mental-health organizations advocate EMDR as a treatment option for PTSD, although some studies6 have shown that the results of this treatment are not very different from those achieved by straightforward exposure to trauma reminders, without concurrent ABS. The psychological process by which EMDR works remains enigmatic, and the underlying neurobiological mechanisms have been largely unknown. Baek and colleagues used mice that had developed fear behaviour (freezing) in response to a sound they had previously heard while receiving an unpleasant electric shock to their feet (Fig. 1a). The authors then led the mice to form an extinction memory by presenting the sound without an accompanying electric shock (an approach that mimics extinction therapy), while simultaneously exposing them to a set of light-emitting diodes (LEDs) that lit up in an alternating left–right sequence (Fig. 1b). This approach was intended to mimic ABS, although (unlike in humans undergoing ABS) it is difficult to gauge precisely how mice direct their gaze and attention to the LED stimuli. Remarkably, nonetheless, the combined extinction and ABS approach led to a clear and persistent decrease in fear behaviour that was more pronounced than that produced by extinction or ABS alone. Figure 1 | An approach to decreasing trauma-associated fear responses. a, Baek et al.2 exposed mice to a specific sound paired with an unpleasant foot shock, creating a memory association between the two stimuli and a fear response when the mice heard the sound alone. b, They then used an experimental set-up in which mice repeatedly heard the sound while looking at light-emitting diodes (LEDs) designed to elicit a specific sequence of eye movements. These mice had reduced fear responses to the sound, compared with mice exposed only to either the visual display or the trauma-associated sound. c, The mice exposed to the combined light and sound stimulation had strengthened excitatory neural connections (blue arrows) in the brain between the superior colliculus and the mediodorsal thalamus, and between the mediodorsal thalamus and the basolateral amygdala. This led to the inhibition (red arrow) of neurons that encode fear memories in the basolateral amygdala. This, in turn, reduced output from those neurons to fear-generating brain regions, lowering fear responses to the trauma reminder. The authors observed that the combined extinction and ABS procedure stimulated the activity of the superior colliculus, an area of the brain that processes visual information and directs an individual’s attention (Fig. 1c). The procedure also activated the mediodorsal thalamus, a region that receives neuronal projections from the superior colliculus. The level of activation of these two regions predicted the extent of the decrease in fear behaviour produced by combined extinction and ABS. When the authors genetically perturbed mediodorsal thalamus neurons to prevent them from firing, the fear behaviour did not decrease. They then used an optogenetics approach, whereby laser light is delivered through a fibre-optic cable to neurons to silence neuronal signalling between the superior colliculus and the mediodorsal thalamus. They found that communication between the two areas is needed for the reduction in fear behaviour induced by combined extinction and ABS. How would strengthening the connection between brain regions more typically known for their roles in sensory processing lead to a reduction in fear behaviour? Baek et al. observed that the combined extinction and ABS procedure dampened the excitability of a population of neurons in the basolateral nucleus of the amygdala (BLA) — an area of the brain that calibrates fear responses7 — that fired when mice exhibited fear behaviour. They then showed that there is a functional, two-step inhibitory connection between the mediodorsal thalamus and the ‘fear-encoding’ BLA neurons. When these BLA neurons were optogenetically silenced, the fear-reducing effects of combined extinction and ABS were lost. These findings, put together, suggest a model in which the extinction and ABS procedures act in tandem to recruit the neuronal pathway that links the superior colliculus and the mediodorsal thalamus. This, in turn, reduces the fear response to the trauma-reminding stimulus that is generated by the BLA. 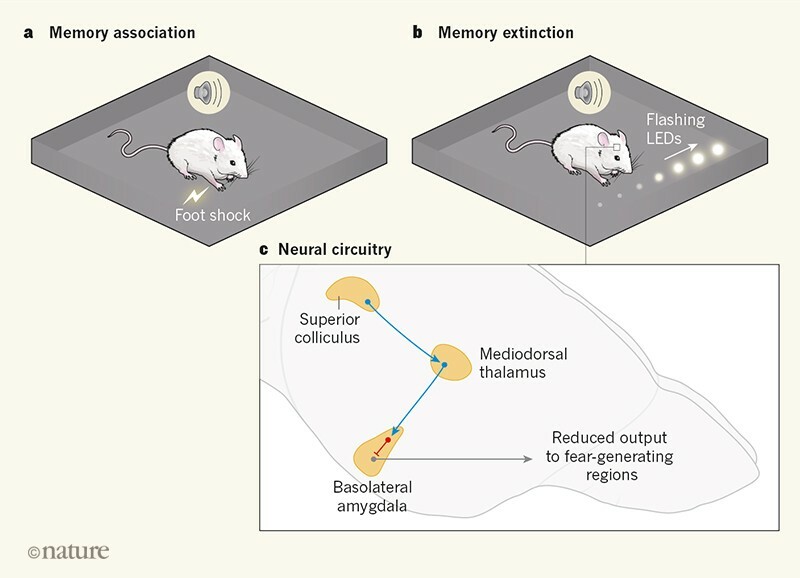 Baek and colleagues’ findings paint a comprehensive picture of one of the main neural circuits that underlie the fear-reducing effects of combining extinction and ABS, albeit in a simplified model system. Yet key questions remain. Given that exposure to alternating bilateral visual stimuli is required for memory extinction, it is important to clarify exactly how a mouse, freely moving around the test chamber, perceives these stimuli. Future studies could fix the mouse’s head position relative to the LEDs to ensure that the animal’s gaze is directed at the alternately flashing lights. A broader question is how ABS, and by extension EMDR, works to aid memory extinction and reduce fear. One interpretation is that visual stimuli serve as distractors, drawing attention away from the fear-inducing stimulus to dampen anxiety and enable encoding of the extinction memory. But that does not explain the authors’ observation that flashing LEDs in a non-sequential pattern fails to reduce fear behaviour. An explanation based on distraction would also sit uneasily with the current view that the process of extinction is enhanced by directing more, not less, attention to the fear-inducing stimulus, because this increased attention reinforces the new connection between the trauma reminder and safety8. Baek and colleagues propose that ABS shifts the balance between competing brain circuits, engaging one set of neural pathways that favour fear extinction to overshadow the influence of other pathways that favour the persistence of fear. Whether or not their model turns out to be correct, this study provides a plausible neurobiological explanation for the behavioural effects of ABS — and possibly, by extension, of EMDR. At the very least, this gives us a tractable foundation for further studies of this enigmatic behavioural therapy. Given the pressing need to provide people who have trauma-related illnesses with a range of effective treatment options, this is a most welcome development. There has been much debate over whether the current technologically driven revolution in neuroscience can help to usher in a new era in treating psychiatric illness. Fulfilling this promise is an enormous challenge, not least because modelling psychiatric disorders and the psychotherapies used to treat them in the laboratory remains difficult9. Key features of trauma-related illness, such as learned fear and fear extinction, can be found even in simple organisms, which makes it possible to map their neural bases in detail. Therefore, trauma-related illnesses might represent a great opportunity for therapeutic research10. Insights such as those provided by Baek et al. offer further encouragement that we will soon see some genuine breakthroughs in how we diagnose, treat and ultimately prevent these devastating conditions. Kessler, R. C. et al. Arch. Gen. Psychiatry 62, 593–602 (2005). Baek, J. et al. Nature 566, 339–343 (2019). Foa, E. B. & McLean, C. P. Annu. Rev. Clin. Psychol. 12, 1–28 (2016). Bukalo, O., Pinard, C. R. & Holmes, A. Br. J. Pharmacol. 171, 4690–4718 (2014). Shapiro, F. J. Anxiety Disord. 13, 35–67 (1999). Salkovskis, P. Evidence-Based Mental Health 5, 13 (2002). Tovote, P., Fadok, J. P. & Luthi, A. Nature Rev. Neurosci. 16, 317–331 (2015). Pearce, J. M. & Hall, G. Psychol. Rev. 87, 532–552 (1980). Nestler, E. J. & Hyman, S. E. Nature Neurosci. 13, 1161–1169 (2010). Hariri, A. R. & Holmes, A. Nature Neurosci. 18, 1347–1352 (2015).